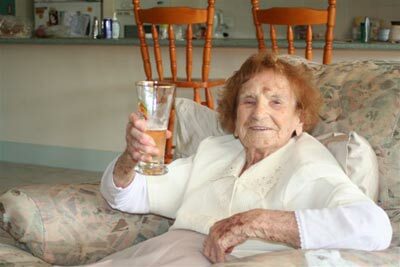 There is a remarkable lady in Australia who is, at least as far as I know, the oldest blogger on the planet. That’s her picture above. October 17, 2007 Posted by oldstersview | People	| Comments Off on Thanks, Knight Rider. A flood of beer swept through the streets of St. Giles, England, on 17 October 1814. Caused by a rupture in a brewery tank containing 3500 barrels of beer, the tidal wave killed nine people and demolished two houses. Link to lots more beer trivia, some of it probably even true. What kind of paint do you use on elephants?